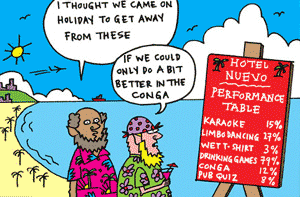 Our longest running cartoon strip, ‘Grim’ follows the adventures and mishaps in the lives of two uber-trendy, urbane sophisticates amid the coffee shops and patisserie outlets of North London. 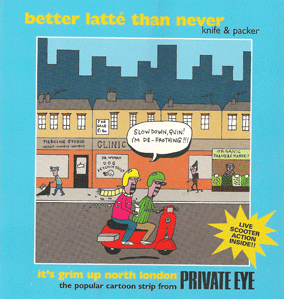 Published by Private Eye, a collection of Grim Up North London cartoon strips. With characters as diverse as Al Capone and Henry the VIII, meet a host of historical figures who feature in this long running cartoon strip, now in its second guise. Gaffe-prone news presenter Anne Finally had a knack of asking all the wrong questions of politicians and celebrities. Highlighting the world’s little known and downright obscure museums and collections, from the Tiverton Museum of the Moustache to the Utrecht Watering Can Collection. Fortnightly single box cartoons tackled this complicated legal area with humour, wit and the occasional woodland animal. Poking fun at those parents who will insist on organic granola and language lessons for their precious teeny ones, Perfect Parents poked (mostly) gentle fun at a certain type of parent – you know who you are! Knife and Packer were commissioned to design and draw a series of cartoon characters for the Department of Culture, Media and Sport website. 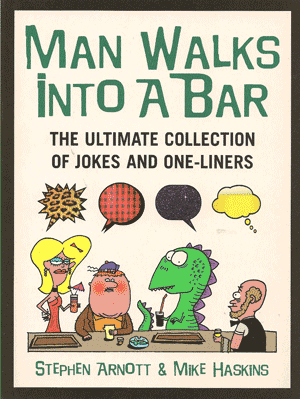 Knife and Packer have created the artwork for several book covers for Ebury Press, including both volumes of the very popular joke book series Man Walks into a Bar. Preposterous Properties appeared every week in the Bricks & Mortar section of The Times and featured the homes of a host of diverse characters from Dracula to James Bond and more. A long running cartoon strip that appeared in Style magazine, Perfect Couple pointed the finger and chuckled at Marcus and Molly, a pair of fashion victims, and their goal of always being stylish. 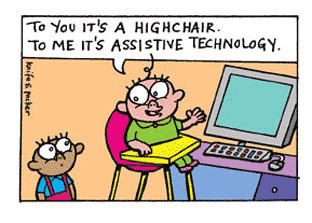 Having both been to school we were more than capable of delivering a weekly cartoon strip that poked (gentle) fun at teachers and the school system. Office Alien appeared in Jobs and Money and featured the life of George, an alien thrown into the modern workplace, struggling with everything from modems to mid afternoon munchies. Following the adventures of Peter, a vigorous 70-something , Bon Viveur featured his escapades and adventures in the 21st century.